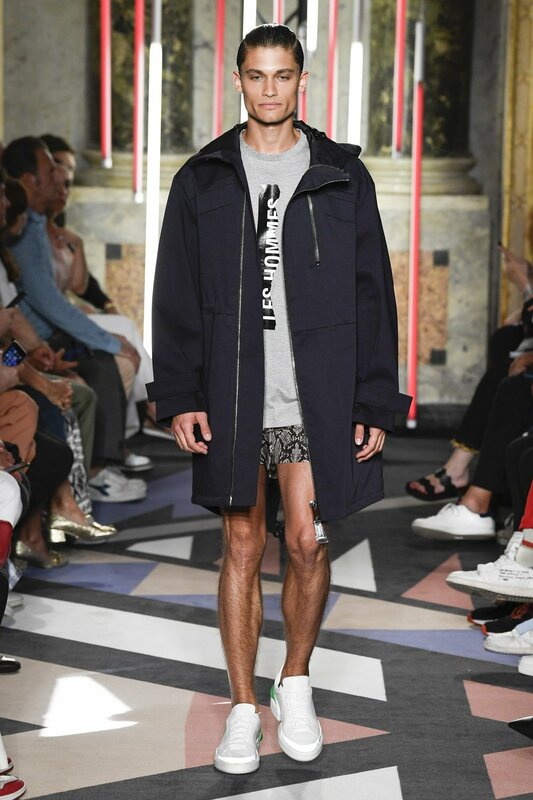 A fantastic mix of casual thoughtfulness, Les Hommes presented looks during their spring/summer 2019 runway show that were incredibly bold yet very simplistic. With the right touch of personal style and a willingness to be a bit outgoing, recreating Les Hommes’ gorgeous garments for your own personal closet can be done so with ease. Style Advice: The gorgeous looks of Les Hommes’ spring/summer 2019 runway show isn’t necessarily difficult to replicate in theory, but you may have to make a few sacrifices in your willingness to expose yourself to achieve the full look. Working from the top, Zara’s Coat With Detachable Interior ($199) is a great place to get started. The dark blues are the perfect way to not only show a little bit of personal style, but help reach a classy look that’s timeless by design. Since this look is more on the casual side, make sure to pick up the H&M T-Shirt With Printed Design ($13). The gray will work well with the blue of the coat, and having the graphic design of the t-shirt lightly expose itself towards the middle of the outfit will yield some great results. As we get lower into the outfit we are attempting to recreate, I’m sure you may notice the… sacrifice that needs to be made. If you are bold enough to wear your underwear in public, it might as well pop. Check out H&M’s 3 Pack Boxer Shorts ($20) for a brief assortment of great designs that can be rotated within the outfit you are putting together. What really ties this whole thing together is the shoes. Make sure you purchase the Adidas POD-S3.1 Sneaker ($120) provided by Urban Outfitters. The white shine of the sneakers will make for the perfect contrast to your gray shirt, and it’ll show that a strong sense of effort has been put into an outfit that seems very casual on the surface. Must Have: As winter rolls in, you’re more than likely going to be on the lookout for some fashionable items that not only look great, but can keep you warm in those frigid temperatures. This season, Comme Des Garcon has you covered with the newly released CDG Knit Stole Scarf ($62). A surprisingly reasonable price for the iconic Japanese brand, this beautiful item comes from a newly made line which is simply named, “CDG.” This first assortment of clothes from the line contains styles ranging from jackets to raincoats, but nothing quite strikes as simple as the Knit Stole Scarf. The stylish repeated pattern with checkerboard bottom and grayscale colors throughout create a product that stays true to the roots of Comme Des Garcon, but offers something a little bit more left field compared to past products of the brand. Gray in itself is a fantastic color to wear in the winter season, as it is very easy to match with almost any coat. Plus, you’ll feel a lot more open to experimentation as the scarf could either lean towards a gray dominant outfit or black, especially considering how well the item caters to both sides of the grayscale color spectrum. 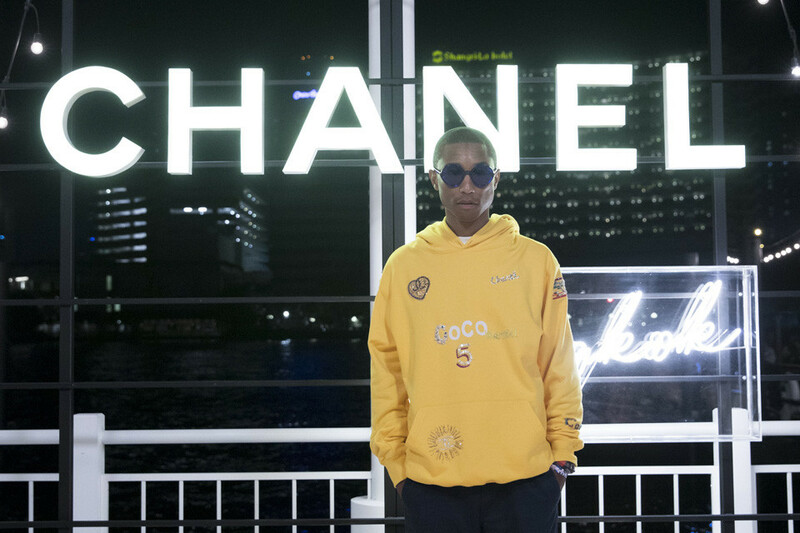 Industry Update: Having collaborated with Chanel in the past, whether it be walking the runway of the Pre-Fall 2017 show or being the first man to appear in a Chanel handbag campaign, it’s no surprise Pharrell Williams is gearing to involve himself with the french luxury company once more. While attending the brand’s Cruise 2018 show in Bangkok, Williams implied on stage that a new collaboration is “coming soon”, pointing at the Chanel logo and drawing attention to his outfit. This was no regular hoodie that Williams had on, however. This yellow garment, covered in sparkling Chanel insignia and featuring the iconic interlocking “C”, is reported by insider sources at the event to have been designed by the man himself, revealing the hoodie to be only one of the items from the future collaboration. Not much is known about the exact creative contents of the partnership, but Dazed has reported that we can expect a drop exclusively on March 29 in Seoul and worldwide on April 4.